...... Hello I know, I know is not even November yet LOL> but it will be soon and let me tell you that after that it will soon be Christmas. That s what we have been up to over at Stamp With Us we have been getting ready to deck the halls as my latest class features a selection of tree ornaments that you can make for your tree and even add a treat inside. Click on the picture to see the detail better. Look at those beautiful ornaments!! I choose the colour scheme to match my guest bedroom which has got a vintage feel to it and is decorated in similar colours. Sage Shadow, So Saffron Very Vannila, lots of Champagne glitter and gold embossing powder. I have used a selection of stamp sets but you could easily keep to one set for continuity, the beauty of SU sets is that they offer more than one image so you can make totally coordinating projects. I wanted to have my cake and eat it LOL. 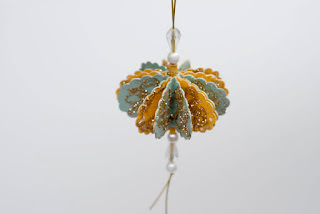 So all those gorgeous things will be used to decorate a little tree in my spare bedroom and I will make sure I fill the boxes with small treats for my guests> The hanging ornaments have been made with the Scallop Oval punch and drenched in glitter, aren't they beautiful? By changing the orientation I ended up with two different looking ornaments. 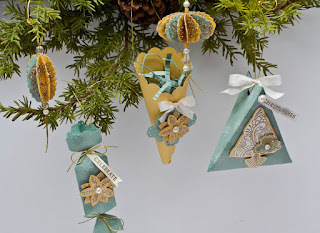 Those will look fab put together to create a bigger ornament. 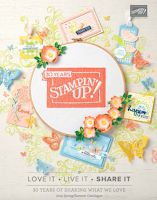 I feel like I haven't talked to you properly for a while well with laptop being dead and with the biggest event in the Stampin'Up! world coming soon ( I am talking about Convention held in Frankfurt next week), Stamp With Us classes time has been of a premium but I have to say I love it being busy the more I have on the more I seem to acomplish so is good but kinda of hard IYKWIM> I am so excited and today I have planned my outfits for Convention. I already now what I am wearing for the Awards Night but saying that I will till take 2 outfits just in case I change my mind LOL, and planned something for the day time. This was difficult because I want to be comfy but smart at the same time, it won't matter too much though as I will be there to enjoy some time with my wonderful team, meet with old friends make new friends and just have a BLAST!! I cannot wait..
ps. Tonight I did something amazing .... I GAVE BLOOD. Beautiful ornaments Monica! I love them...tfs!!! What a great colour combination for a hint of Christmas in the Guest Room...calm and peaceful with a touch of glitter. I love the ornaments and the idea of chocolate in them as well. followed a link from Crafty Blogs. Those ornaments are beautiful, and welldone on giveing blood. I don't weigh enough but my siblings all give blood regularly. Wow Monica those decorations look gorgeous!! !